VADODARA, India - Dec. 6, 2018 - PRLog -- , the Michigan based organization has kick-began exchanges with notable home-developed snack producer Haldiram's for a super union. 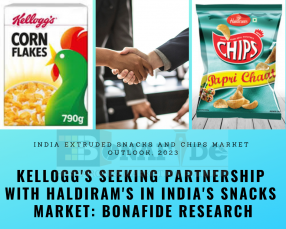 Kellogg is keen to diversify beyond its core breakfast cereal category and enter the ethnic snacks & sweets segment and has initiated talks to invest a 'significant' amount in the Delhi & Nagpur arms of Haldiram's. Haldiram's wants to scale up their domestic business & also improve global presence. The proposed transaction is limited only to the packaged products business of Haldiram's. Top snack maker Haldiram's has three areas of operations with Haldiram's Snacks and Ethnic Foods, which clocked around Rs 2,000 crore from the north last year, Nagpur-based Haldiram's Foods International that caters to western and southern Indian markets with annual sales around Rs 1,600 crore and Haldiram Bhujiawala, for the eastern market with revenues aaround Rs300 crore in 2016. Both Extruded snacks and Chips market has shown CAGR of more than 9% in Forecasted period. Increasing consumer's awareness towards healthy and packaged snacks has created a huge demand of Extruded Snacks and Chips in last five years. The market is so diverse that it can be classified based on the product base as well. For example; potato, rice, corn, cereals & pulses, gram flour, nuts and seeds based and the flavour/taste based such as salty, tangy, spicy, onion, garlic or cheese. With the entry of global and regional players that have capacity for R&D and capital to spend on understanding consumers, they can come up with new segments to satisfy the tastes and preferences of Indian consumers. As Indians are known for their affection towards local culinary taste and flavours, these players come up with a third type of savoury called "bridge snacks" meaning taste and flavour is local but the product format adopted is western. With higher purchasing power resulted due to the high economic development of India has resulted in changing preference of Indian consumers. The consumers are observed to be preferable from traditional snacks to western snacks of regional, national brands. PepsiCo, ITC, Parle, Prataap Snacks, Balaji Wafers, Haldiram are some leading existing palyers in Extruded and Chips Snacks Market. Another report published by Bonafide Research "India Chips (Potato, Banana, Tortilla, Multigrain) Market overview, 2018-2023". India chips market has shown remarkable growth in past couple of years. The market is forecasted to grow with a CAGR of more than 9% in near future. Currently, the growing young population (below 15 years) represents a key segment for the potato chips market. Major factors driving the global demand of potato chips are growing urbanisation, rise in disposable incomes and rapidly changing lifestyles. A busy lifestyle coupled with long working hours have forced people to shift from elaborate luncheons and meals to desk snacks and packaged foods. Snack companies are branching out from original recipes and launching line extensions that deliver interesting ingredients, flavours and textures to consumers looking for new experiences or alternative ingredients for health reasons. Existing players includes PepsiCo, Balaji Wafers, Prataap Snacks, Haldiram, are some leading players in Chips Category. • To analyse and forecast the India Chips market size, in terms of value and volume. • To analyse and forecast the India Chips market size, in terms of volume. • To define, classify and forecast Chips market on the basis of types like Potato, Tortilla, Multigrain, and Banana etc.